Nice template with great functionalities. File structure is clear, so you can rewrite it easy if necessary. It's a great theme with great functionalities. Totally worth the price. Make everyone feel the drive with the contemporary design in contrasting colors - black, white, red. The choice of this trio creates an effective visual tone and a strong impact on the viewers. The design is intended for blog delivering the latest sport news. It's content wise, social friendly (the emphasis is put on inviting visitors to stay in touch with you), good for featuring a lot of video content (you can embed video in every block of information in the content part), goes with audio player options and user-friendly. It&#039;s a great theme with great functionalities. Totally worth the price. Easy and complete. Great template. 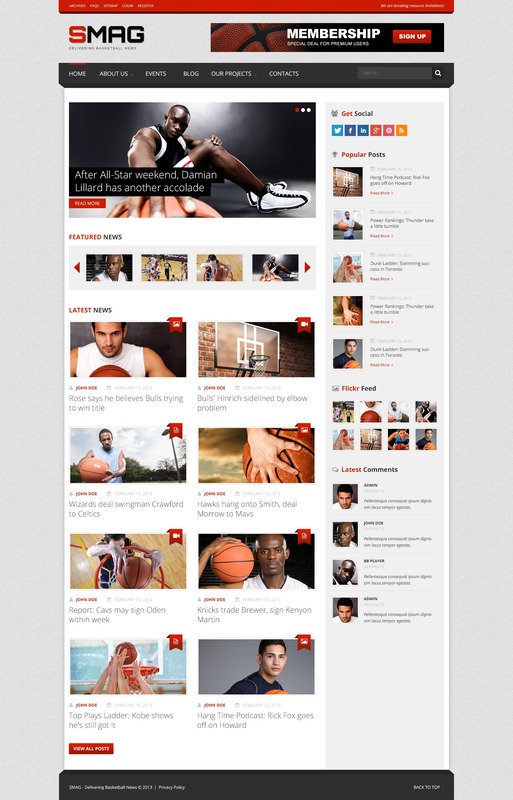 This theme is a great looking and functioning Wordpress template which can be used for all type of sports but in particular basketball based sites.